Students will draw a person from memory and complete a drawing activity that will make them draw on the right side of the brain. STEP #1 On your copy paper draw a quick sketch of a person from your memory. From head to toe. Spend 2-3 minutes on it. Has to be a human. Why did you draw the way you did? Drawing from memory brings forth memorized symbols from your childhood. For example a circle for the head. Circles for the eyes. Triangle for the body, etc. STEP #3 SHIFTING FROM LEFT TO RIGHT MODE DRAWING ACTIVITY On the back of your copy paper. 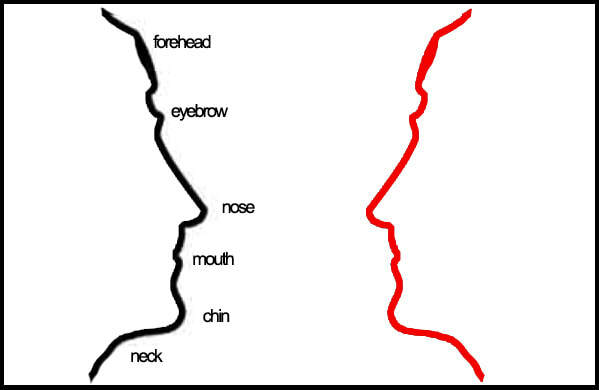 Draw the profile on the left. You will use your left brain for this. 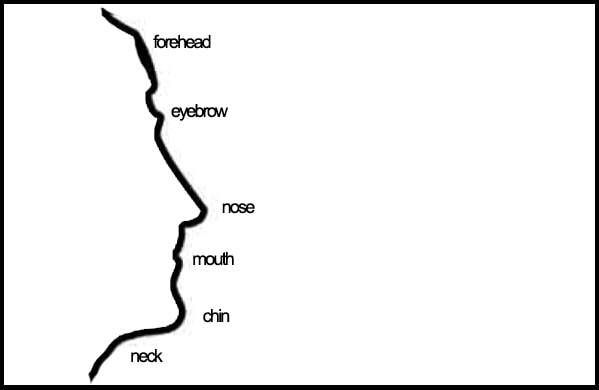 As you draw the profile label all the parts of the face. Draw, stop and label. Draw stop and label. As you label your left brain will help you complete the drawing. STEP #4 LEFT MODE Now go to the right side and draw the missing profile. Do not label the facial parts. Just copy the line you see on the left to the right. YOU ARE NOW DRAWING IN RIGHT MODE. It is not a human profile it is just a curvy line. The right profile should be harder to draw. Write your name and period # on the front or back of the paper.